Shinn Estate Vineyards 2007 Cabernet Franc was one of the best Cabernet Franc’s I have ever had. A “benchmark” wine is a description that was tossed around in various wine circles. When the 2007 Cabernet Franc sold out, I thought to my self, what would the 2008 be like in comparison. I should not compare, and I will try not to. Comparing vintages is fun, but at the same time it is like comparing kids each one is different. I was always compared to my younger brothers in school because they were smarter than me. I hated it. So 2007 is long gone and now we have the next vintage to look forward to. Shinn Estate Vineyards 2008 Cabernet Franc ($38) is a wonderful followup to its 2007 counterpart. 2008 was not that stellar of a year. It was nothing like 2007. But in 2008, with the right practices and the right work in the vineyard and in the cellar, some places were able to get ripe fruit flavors. And this 2008 from Shinn Estate Vineyards is nothing but ripe. On the nose there is classic Cabernet Franc aromas — raspberry and cherry; dried herbs like basil and sage; exotic spice like cardamom, coriander and anise. Notes of fresh earth and juicy fruit bramble mix with some whole black peppercorns. Hints of dried flowers, bay leaf and savory herbs round out the aromas. On the palate the aroma of dried savory herbs, like sage lead the way but slowly give off the hints of ripe raspberry and cherry. Cedar and hints of spice mingle with hints of vanilla, mint and eucalyptus. The finish carried the vanilla note with hints of berries and mint. I was very intrigued by the vanilla. It added a “sweetness” to the wine. Not a sugary sweetness, a sweetness that kept me coming back to the glass. …. 2008 Cabernet Franc from Shinn Estate Vineyards ($38). Loads of berries right up front on the nose; Raspberry, cherry, boysenberries and currant. It was spicy and herbal with some mint and dried basil. The spice elements of the wine were exotic and arousing, some cinnamon, anise, cardamom and coriander with a fresh black pepper kick. It was earthy and tasty. It was the first wine that I needed a second glass during the tasting and it went perfectly with my second helping of the Duck and lentil stew. This showed very traditional Shinn elements and is a great follow-up to the current release, the 2007 Cabernet Franc. 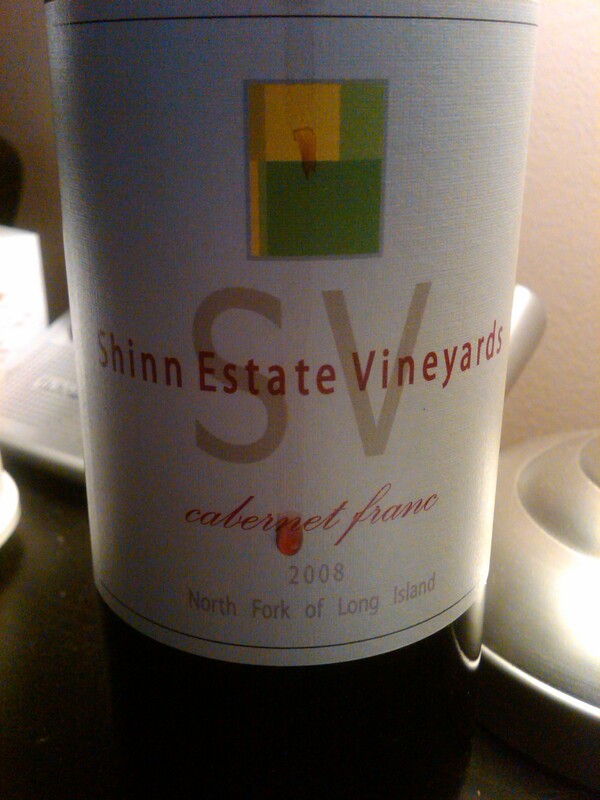 This entry was posted in 2008, Cabernet Franc, Long Island, Shinn Estate Vieyard. Bookmark the permalink.